A piece of ‘brain stone’, a kind of petrified coral. You are here: CollectionsOnline / A piece of ‘brain stone’, a kind of petrified coral. 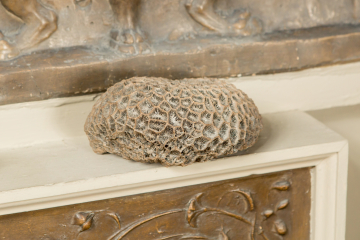 This collection of items was designed to demonstrate the close connection between architectural or man-made sculptural forms and natural forms with this piece of ‘brain coral’ alongside casts of feet, and ribbon mouldings which resemble vertebrae.